The Kotaku Robot Wars continue on the other side of the world, as Osaka Japan and Canberra Australia are reduced to steaming piles of rubble and broken robot parts...but whose broken robot parts? Once more we pit the power of human intuition against the mechanical will of Crecente's R2-D2 robot to try and predict the outcome of the Kotaku Robot Wars. At last count the humans and the robot were tied, both correctly predicting the outcome of two battles - Optimus Prime VS. Dog and Kos-Mos VS. Portal Turrets - while fan favorites Mega Man and the Fruit Fucker 2000 fell in combat against HK-47 and Chrono Trigger's Robo. The results for round 2 are in, and they aren't looking good. Representing human intuition, you folks voted for who you thought would win the battles of round 2. Here are the results. Once again Crecente fired up his autonomous R2-D2 droid, setting it wandering free amidst scraps of paper with names written on them. In the end, R2 found the scraps containing the names Optimus Prime and Robo to be the most attractive. Which group predicted most accurately? Osaka Japan is in ruins, terrified citizens fleeing with whatever possessions they can as the ground rocks with the sounds of gunfire, explosions, and large metal footsteps. Optimus Prime grows increasingly more frustrated as the smaller, more agile HK-47 slinks in and out of buildings, seemingly firing from all angles at once. Staggering backwards, Optimus falls against the local Kotaku Tower, causing it to tumble to the ground. With a look of grin determination in his eyes he wills his chest plate open, reaching for the Autobot Matrix of Leadership. "Now light our darkest...wha?" HK-47 rounds the corner, wearing the Matrix as a hat. "Oh, does the over-sized droid require this?" he asks, taking the Matrix off and tossing it into Optimus' eager hands, turning to walk away as the explosive filled artifact detonates. Meanwhile, in Canberra, Robo fires a barrage of lasers at Kos-Mos, who barely manages to dodge the onslaught. She sustains little damage, but her clothing is torn to shreds. Robo's sensors overload, and he explodes, taking the last remaining Kotaku Tower with him. But wait...in Atlanta Georgia, one last Kotaku Tower springs to life, having been powered off accidentally due to a cat chewing on the power cables. As soon as the power is restored a brilliant flash of light erupts from the tower's apex, and both remaining combatants appear. The transponder atop the tower holds the one remaining pathway back to their respective universes, and all that is standing in their way is each other. 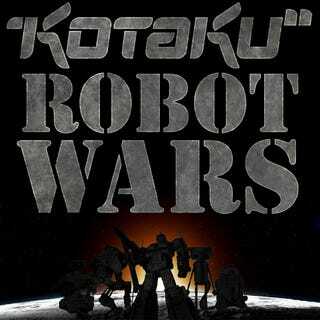 Tune in tomorrow for the epic conclusion of the Kotaku Robot Wars!